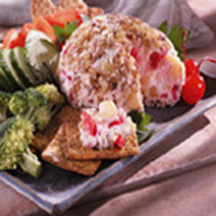 A festive and colorful party cheese ball made with cream cheese, chopped maraschino cherries, crushed pineapple and toasted walnuts. Drain maraschino cherries on paper towels. Chop cherries and drain again. Beat cream cheese with electric mixer on medium speed 3 to 4 minutes, or until cream cheese is smooth. Stir in pineapple and cherries. Refrigerate until firm, about 1 hour. Shape cheese mixture into two (4-inch) balls. Roll cheese balls in walnuts, pressing nuts into surface to adhere. Refrigerate about 1 hour or until chilled. Serve as a spread with crackers or vegetables. Makes 2 (4-inch) cheese balls. Tip: You can prepare this appetizer in advance, then freeze it for later use. Allow cheese balls to thaw in refrigerator before serving. Recipe and photograph are provided courtesy of the Cherry Marketing Institute.